These are Visual Basic Project files, Available for download for learning and reference. 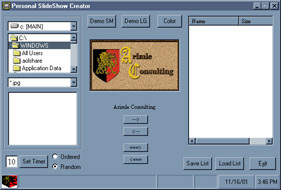 Arimle Consulting is developing this easy to use slide show program that will take pictures from any where on your personal hard drives and and use them as a slide show screen saver. The program (ACScrnSvr.zip) is designed with a simple user interface allowing picture selection, background color change, and viewer time change.